Posted February 7, 2017 by finnfemme & filed under Beauty, Fashion, Vintage. It was really cool to see the photos of Christie Brinkley (63) modeling for the Sports Illustrated Swimsuit, along with her daughters Alexa Ray Joel (31) and Sailor Brinkley Cook (18). I thought they all looked happy, healthy and gorgeous. 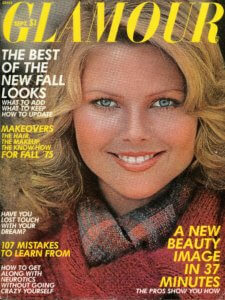 Christie is a little older than I am, and I’ve followed her career since she first started out modeling in the 1970s. From my teetering stash of vintage fashion magazines, I found the September 1975 issue of Glamour magazine with Christie on the cover. I’m pretty sure that this is one of her first modeling ventures, and it was the start of the All-American Blond California models that epitomized a good part of the 1970s fashion scene. 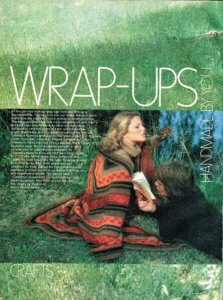 In Glamour’s editorial pages Christie modeled chunky sweater wrap-ups that had a handmade look, or could be knitted or crocheted by you. A different look from SI’s Swimsuit Issue (that came about 4 years later), but I think she looks fantastic here too. Christie also made her way into the beauty pages, modeling a pretty hairstyle. The finished look of soft waves and curls was accomplished in 12 minutes using Clairol’s Kindness electric rollers (a 70s beauty staple).